A world of Greek Legend with an online pokies twist! 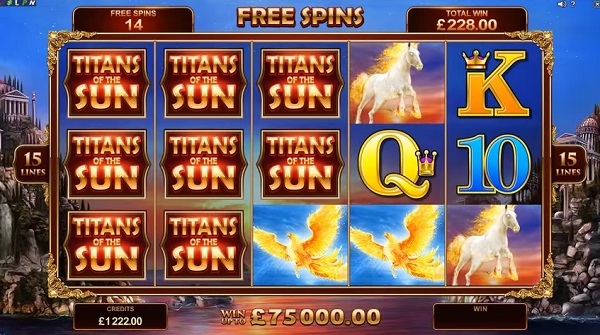 Titans of the Sun is Microgamings latest pokies game combining ancient adventure with romance, all in a 15 payline, 5 reel slot. Titans of the Sun (Theia and Hyperion) are available to play as PC download or instant Flash with glorious HD graphics. Hyperion and Theia appear in Greek Mythology as the Titan children of Gaia and Uranus and according to legend Hyperion fathered three children with his sister Theia. 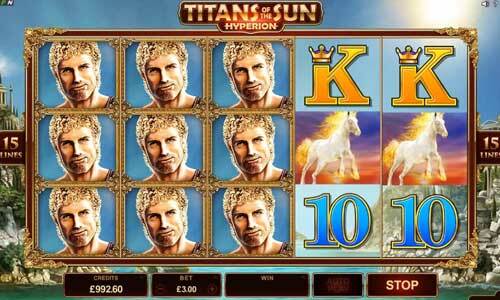 Play the free version of Titans of the Sun pokies above and see how much money you can win! In this game Hyperion and Theia, take players on a ancient Greek adventure filled with Wilds, Scatters, and mythical symbols with the ultimate payout to claim the Titan’s treasure. 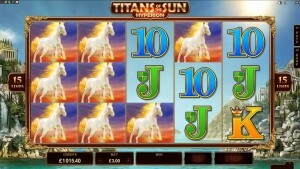 Titans of the Sun is set within a stunning Mediterranean coastal backdrop and symbols range from the Titans themselves, to the mythical creatures gliding through the pokies lines. There are two options when playing Titans of the Sun, either Theia or Hyperion mode which provides a different main character. 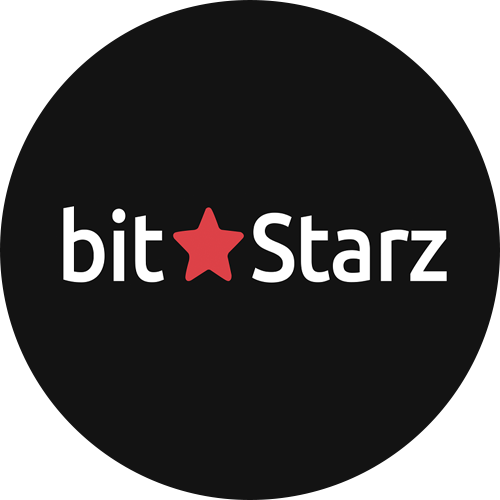 Bitcoin pokie style special bonuses include Free Spins and a new Mystery Symbol. The Free Spins are won when 3 or more scatter symbols (the god and goddess) land on the reels. Players win 15 Free Spins, with the possibility of a retrigger. The wild logo stands in for any game symbol, except the scatter. The new Mystery Symbol stacks up to five symbols high on all the reels and transform into any high or low symbol when landing and in the Free Spins the Mystery Symbol can also be a Wild symbol. Mega Symbols also make an appearance in this game where a big block of 3×3 symbols can land anywhere to ignite a huge payout. Titans of the Sun pokies is very similar to some popular Aristocrat titles with surround sound and excellent gameplay that will have you playing for hours!